Bulgaria's Belene Nuclear Power Plant will not be constructed, the country's Deputy Finance Minister Vladislav Goranov announced on on Wednesday. A natural gas power plant will be built in the Danube town of Belene instead, Goranov told reporters after Wednesday's Council of Ministers sitting. The nuclear reactor already assembled by Rosatom subsidiary Atomstroyexport and originally meant for Belene will be placed in Bulgaria's sole nuclear power plant, Kozloduy. On Thursday, Bulgaria's newly appointed Economy and Energy Minister Delyan Dobrev will travel to Moscow in order to inform Russia of his country's decision to scrap the project. The construction of the 2000 MW plant by Atomexportstroy had been delayed with annexes 15 times. At the end of last week, Bulgaria's Prime Minister Boyko Borisov said in a TV interview that Belene would never remain just a Russian-Bulgarian project and would not go forward without a European or American investor. A few days ago, his Deputy, Finance Minister Simeon Djankov, admitted that Bulgaria has "almost given up on the project." Russia's state-owned nuclear corporation Rosatom had made it clear it is ready to agree on yet another extension of the contract with the Bulgarian government for the construction of the Belene nuclear power plant. The currently active extension of the 2006 deal between Bulgaria's National Electric Company NEK and Rosatom's subsidiary Atomstroyexport was set to expire at the end of March 2012. In October 2011, Bulgaria and Russia reached an agreement to extend the negotiations over Belene nuclear project by another six months as of the beginning of October amidst continuing haggling over its price and feasibility. The greatest issue over which Bulgaria and Russia had been haggling for the past two years under the Borisov Cabinet was the price of the project, with Russia insisting it should be no less than EUR 6.3 B, while Bulgaria was demanding a price of no more than EUR 5 B. After selecting the Russian company Atomstroyexport, a subsidiary of Rosatom, to build a two 1000-MW reactors at Belene and signing a deal for the construction, allegedly for the price of EUR 3.997 B, with the Russians during Putin's visit to Sofia in January 2008, in September 2008, former Prime Minister Sergey Stanishev gave a formal restart of the building of Belene. At the end of 2008, German energy giant RWE was selected as a strategic foreign investor for the plant. In November 2010, shortly after a visit to Sofia by Russian PM Putin, Bulgaria's National Electric Company NEK and Russian state company Rosatom signed a memorandum providing for a final fixed price for the two reactors of EUR 6.298 B. According to the non-binding memorandum expiring on March 31, 2011, Bulgaria's NEK would have had a share of 51% in the Belene NPP, Rosatom – a share of 47%, Finnish company Fortum - a share of 1%, and French company Altran Technologies - a share of 1% with an option to increase it. Serbia had expressed interest in acquiring a share of 5%-10%. 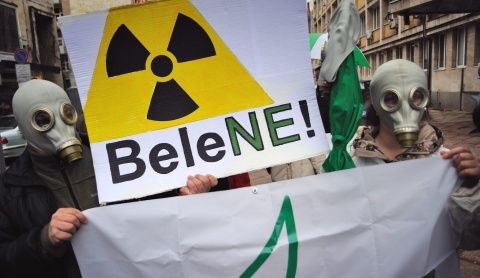 In mid-March 2011, apparently acting on concerns caused by the situation in Japan's Fukushima NPP after the recent devastating earthquake there, the European Commission confirmed that it wanted to reexamine the Belene NPP project - once Bulgaria finds an investor for it - even though it already approved it back in 2007.